Monarch’s urgent care provides critical mental health, substance use disorder services in Wake offering a necessary bridge for those requiring immediate attention and a diversion from hospital emergency departments. Behavioral health care is changing to meet the mental health and substance use disorder needs of the greater Raleigh area with Monarch’s Wake County Behavioral Health Urgent Care (BHUC), a designated intervention and treatment location. The Wake County BHUC opened its doors today at 319 Chapanoke Rd., Suite 120, Raleigh. This same day walk-in service is a result of a partnership between Alliance Healthcare, the region’s managed care organization (MCO), and Wake County. 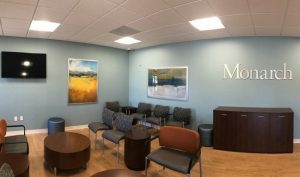 Monarch’s Vice President of Operations for Outpatient Services Robin Henderson-Wiley said the new behavioral health urgent care provides assessment, stabilization and psychiatric intervention for individuals ages 4 and older who are experiencing mental health or substance use disorder crises. A multidisciplinary team that includes licensed therapists and experienced medical professionals supports and advocates for individuals seeking treatment. Statistics have shown that states utilizing the BHUC treatment model have reduced emergency department visits by more than 20 percent. Henderson-Wiley said the BHUC provides immediate attention and links individuals to support, treatment and resources for their mental health crises, and serves as an alternative for people who have usually relied on assistance through the traditional hospital emergency department where waiting for treatment can be lengthy. 8 a.m. – 1 p.m. The last person will be seen one hour before closing time. For more information, call (919) 703-2845. Established in 1958, Monarch provides support statewide to thousands of people with intellectual and developmental disabilities, mental illness and substance use disorders. The organization is nationally accredited by The Joint Commission. Monarch operates The Arc of Stanly County, which is a chapter of The Arc of North Carolina and The Arc of the United States. To learn more about how Monarch provides quality support, please call (866) 272-7826 or visit www.MonarchNC.org.